It’s 10:30pm. You’ve had a long day and have an early morning tomorrow. Pajamas on. Teeth brushed. Pull out a makeup wipe and do a once over so at least today’s makeup isn’t tomorrow’s too. Raise your hand if this is you. No judgement. This used to be me as well. Photos. SO. MANY. PHOTOS. You begin to notice every small flaw on your face. Cleansing. The real stuff. The intention is to remove makeup, dirt, and bacteria from the skin. Acne is caused by a combination of sebum (oil), bacteria, and dirt left in pores. EW! Cleansing is the first line of defense. I personally prefer the feeling of a luxurious cleansing oil. I used to be a huge fan of coconut oil too. Unfortunately it is not an oil that works well on facial skin because it is highly comedogenic. Meaning, it clogs pores. Additionally, it will wear away at your moisture barrier over time. I learned this the hard and painful way. Coconut oil IS great when added to a hot bath. Talk about glowing skin! Currently, I am obsessed with the Sonia Roselli Beauty Japanese Cleansing oil. It’s pretty, feels great, and leaves my skin feeling clean and smooth! I have been known to walk around the house massaging my face for several minutes. Which only helps increase blood flow giving a natural glow to the skin. Best of all, this product is beneficial for ALL skin types. But wait, can I use oil on my oily and acne prone skin? YES! In fact, it is often very beneficial for an oily skin type to use oil. Often, a surge of oil on the face is due to removing too much of it. By using an oil cleanser, you are balancing the oil levels on your face as supposed to stripping it all away. Oil is our skin’s natural anti-aging cream. For a deeper understanding, visit this article on the Telegraph. This is a key step in keeping your skin happy, healthy, and young! As we age, our skin is less able to renew itself. So, we must help it by removing the extra dead stuff on top. IMPORTANT! You can over exfoliate! There is absolutely no need to exfoliate daily, even if the bottle says so. You will over work, irritate, and in fact aid in the aging process. Yuck! Exfoliating should start around the age of 16, but only once a week. Around 20, twice a week and by 30 you should be exfoliating 3 times a week religiously. If taking care of your skin becomes a habit while you’re young, it is a much easier task. If you have children, incorporate rinsing with water into their morning and evening routines even as young as 5! As they get closer to their teenage years, add a gentle cleanser to help remove bacteria and dirt. They will thank you later! There are two types of exfoliants: chemical and mechanical. According to the Dermal Institute, “Chemical exfoliation employs a variety of means to achieve skin renewal such as hydroxy acids (i.e. Lactic Acid, Salicylic Acid and Glycolic Acid), Retinol (i.e. Vitamin A) and enzymes (i.e. Papain, Bromelain and protease enzymes from Bacillus microbes). Mechanical exfoliation employs the use of either a tool (i.e. a brush or sponge) or substrate (i.e. Corn Cob Meal, Rice Bran, Date Seed Powder, Oatmeal, etc.) that, depending on the amount of friction and nature of abrasive used, loosens and reduces the outer corneocytes. Take caution, because excessive abrasion can result in skin irritation, which is why The International Dermal Institute only recommends the use of abrasives that do not result in irritation. Therefore, we do not recommend the use of crushed fruit pits, shells or similar damaging substrates.” Visit the Dermal Institute website for more information. I love using the Sonia Roselli Sexapeel. It is gentle, effective and disgustingly cool! Why? Because you actually see your skin sloughing off! Not to mention that you can use it on your entire body! Note: take off all jewelry before Sexapeel-ing unless you want to be cleaning them after. Prone to razor burn? Sexapeel. Fine lines and wrinkles are due to the depletion of water in our skin cells. Moisturizer attempts to reverse this effect. My personal favorite is the Sonia Roselli Water Balm. It is fabulous for all skin types and can also act as a makeup primer before foundation. I use this on every single makeup client! It surges the skin with so much goodness and is in fact an all in one miracle product: day cream, night cream, serum, eye cream and makeup primer all in one! You can find detailed directions of how to use these three products on my blog post: the Foundation is Skin. 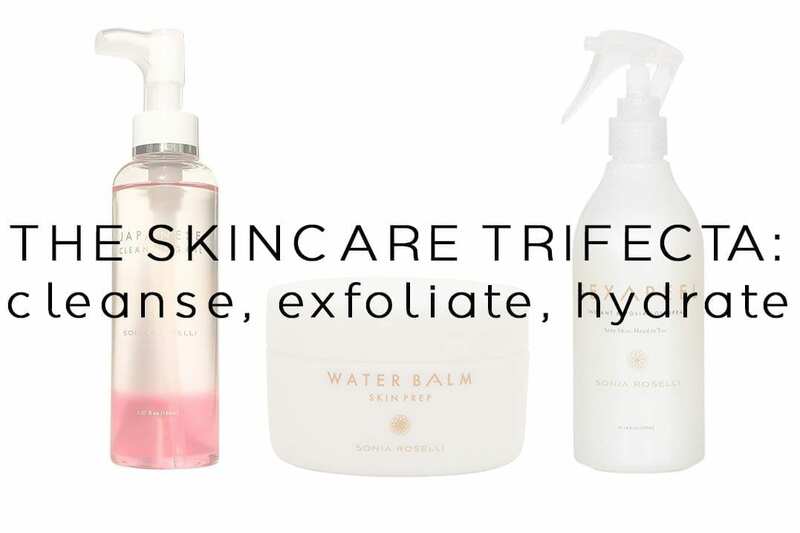 Clearly I am a big fan of the Sonia Roselli Beauty products. And for the sake of total transparency, the provided links are in fact to my affiliate page. However, I never vouch for a product that I haven’t tried on myself, then clients, and absolutely loved first. But this is only the beginning. And if this is all you are willing to start with, you will still see some amazing changes in the look and feel of your skin. First of all, water intake. Yes, your doctor, mom, babysitter, aunt, uncle, and grandma have always pressured you to drink lots of water for your health. But did you know that it also helps with your skin!? By increasing your water intake, you are helping to flush out the toxins in your skin resulting in a more clear complexion. This is the number one advice I give to all of my brides. If you have been a KBB bride, you have received a text 2-4 weeks before the big day reminding you to drink more water. Ok, so that was easy right? There is still more that you can do! Before applying moisturizer, I like to treat my skin to a serum or two. You can buy a Vitamin C serums on Amazon. So, you weren’t the best about wearing and reapplying SPF as a kid. Or you even went so far as to apply oil when out in the sun. Regardless, most people start seeing sun damage around the age of 25. At first it may show up as a few cute freckles across the face. Eventually, these spots get larger and less attractive. Even before this, however, sun damage can show up as lighter or even white patches on the skin. Just over a year ago, a clinical esthetician pointed out two large white areas on my cheeks. The precursor to more visible sun damage to come. She suggested I try a brightening serum. I did my research, tried a product that did almost nothing, and then fell upon the Admire My Skin Ultra Brightening Serum. Within a matter of weeks I saw my spots reduce in size and my complexion become more even overall. Not to mention that this product is half the price of the first one I tried! I like to use four pumps across my chest, neck and face both in the morning and evening. Many people forget to care for their neck and chest! However, make sure to take a break from the Ultra Brightening Serum for a week every month so your skin doesn’t get used to the product, resulting in a lack of continued results. Another very important product is SPF. Daily use will help prevent from further damage. I personally love the Andre Lorent Daily Rehydrating Sunblock SPF 30. The texture is amazing and doesn’t leave a heavy or greasy residue. It absorbs well into the skin and can be used in place of a moisturizer. I, however, allow the Water Balm to absorb for five minutes while I brush my teeth and take my supplements, then apply the SPF on top. Who has seen those memes “if you played with a cabbage patch doll, it’s time for an eye cream”? So true! And in fact, probably well past the time that eye cream is necessary. Nevertheless, there is no time like the present. I have tried countless numbers of eye cream and never felt like one truly improved the look of the under eyes. Until Rodan and Fields. Yes, their products work! Within a week I saw noticeable improvements around my eyes: more plump and less fine lines. I even use it on my laugh lines. You can easily find a rep, likely by looking on your facebook feed. The weather changes, and you probably notice a difference in your skin, especially when the air is cold. Cold air is so harsh. I like to add a few drops of Jajoba oil just before my moisturizer. Sometimes I will drench my face in in the oil for an hour or more before my evening skincare routine. The extra moisture helps to protect your skin. However, I like to avoid my oily t-zone when apply oil in the morning. This helps my skin to feel more balanced, and keep my glasses from sliding off my face. So. It seems like a lot right now. You’re going from spending 30 seconds to 2-5 minutes on your skincare. Try adding one or two products at a time until you have a routine that works for you. Keep a solid routine for a month, then reevaluate. Has the routine itself become enjoyable? I’d be surprised if you answer either of these questions with a “no”. Best of luck in your big life changes, and don’t hesitate to reach out with questions! Kim Baker Gomez was born and raised in the San Jose, California. While education was her primary career path from eight years old, she found pleasure in the art of makeup through dance. After college, she attended esthetics school at San Jose City College where she met mentor and friend, Priscilla Francine Makeup. Kim fell in love with weddings and started her own business shortly after. She uses her knowledge of skincare to educate her clients and create looks that are beautiful and long lasting. Kim loves and feels so honored to be alongside her brides through such an important time in their lives.